Anne Kelemen, 90, lived through Kristallnacht in Vienna and then left for England in May 1939 as part of the Kindertransport. The trauma she suffered by being separated from her parents has marked her entire life. Anne Kelemen, now of New York City, was a girl of 13 on Nov. 9, 1938, when her father’s textiles shop in Vienna was ransacked and destroyed by brown-shirted youths. Culminating months of a deteriorating environment for Jewish residents of the Austrian capital, Kristallnacht – “the night of broken glass” – marked an ominous turning point in Nazi treatment of Jews. This year, as we mark the 77th anniversary of Kristallnacht, the Claims Conference remembers its victims and continues working towards helping all Jewish victims of Nazi persecution. Anne Kelemen fled Austria on the Kindertransport in May 1939 and has borne a lifetime of grief from being torn from her family. In 1938, Austria’s Jewish population was 182,000 and there were about 70,000 more citizens who were of mixed Jewish-Christian heritage. After the Anschluss – the annexation of Austria by Germany in March 1938 — the situation grew dire for Jewish residents. Anne remembered watching from her apartment window a group of elderly Jewish men forced to write “saujud” – swine Jew – on the pavement and then scrub it off. When school started that September, young Anne was told by her teacher to sit in the back with the other Jewish students, and that the Austrian students must ignore them. A synagogue in Baden-Baden was one of more than 250 that were burned during Kristallnacht. The Gestapo ordered that firefighters and police were to do nothing to halt the mass destruction carried out in Germany and Austria the night of November 9-10, 1938. “There were five Jewish girls in a class of 22, and all the non-Jews turned the other way,” Anne recalled. “And we had known each other for years. We were not called on by the teacher. We became non-people in 24 hours. It was heartbreaking.” Anne and the other Jewish students were soon thrown out of school and sent to an all-Jewish school, which happened to be in the back of the building that housed the local SS office. But that early November night brought the horrors right into their own family. Hundreds of Jewish-owned businesses, and synagogues and Jewish cemeteries were ruined during Kristallnacht. Approximately 7,500 Jewish-owned businesses and 267 synagogues were destroyed in Germany, Austria and the Sudetenland, according to SS leader Reinhard Heydrich at a meeting with top Nazi leaders, including Hermann Göring and Joseph Goebbels, held on November 12. Mobs of people, both Nazis and ordinary citizens, rioted throughout the night. Ninety-one Jews were killed and an estimated 30,000 arrested and sent to concentration camps. Hebrew prayerbooks and other Jewish religious texts damaged by fire at the synagogue in Bobenhausen II. One of those destroyed shops was owned by Anne’s father. “My father, Sandor Kelemen, went to work at the little shop. He was so trusting and so honest,” Anne recalled, saying that he had a very good relationship with the local policemen. “A group of brown-shirted boys came in from the street. They asked if he owned the shop. They had sticks and iron bars and they smashed everything that could be smashed. My father said, ‘What are you doing?’ He thought they were hoodlums. He went to a policeman at the corner, and said, ‘Herr Policeman, please help me.’ And the policeman said, ‘I can’t help you, you have to go to the police station.’ And so he went and there he made a report,” Anne said. 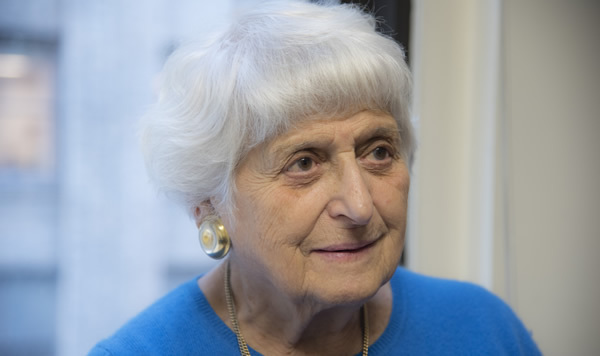 Anne immigrated to the United States in 1950, and had a successful career working with the elderly at a Jewish social welfare agency in Manhattan. But, Anne says, she spent years searching for her parents, and suffered from depression. A friend directed her to Selfhelp Community Services, one of the many New York organizations that receive funding from the Claims Conference to aid Holocaust survivors. Anne, now age 90, lights up when she talks about Michele, her social worker at Selfhelp. For about seven years, Michele has been checking in on Anne, making sure she does not sink into the depression that gripped her for so many years. “We have a first-rate relationship,” Anne says. She is grateful to the Claims Conference for enabling her to receive services from Selfhelp. “Michele is the living example of the help I receive from the Claims Conference,” Anne says firmly. Anne also received a payment from the Hardship Fund and receives an Austrian government pension. Ultimately, we all know that these funds help her live her life with more dignity but nothing can bring back what was so cruelly taken from her. The horrors Anne remembers from her youth, more than three-quarters of a century ago, have not been blunted by time. Her grief at being separated from her parents in 1939 still plagues her. Anne’s neighbors and fellow Austrians stood by as her family was attacked. Today 77 years later, we are not “standing by.” We are there for Anne, and the tens of thousands like her, who need us.